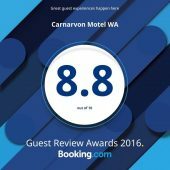 If you’re looking for places to stay in Carnarvon, look no further! 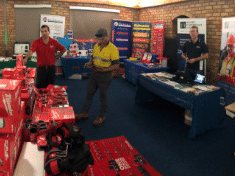 Carnarvon Motel is a well-appointed motel in the heart of the picturesque Gascoyne Region, which is approximately 904-kilometres north of Perth on the west coast. Known for its banana plantations and warm climate, and as the gateway to the Ningaloo Coast, Carnarvon is the ideal spot for your next vacation. Featuring an outdoor pool, children’s playground, games room and free Wi-Fi in every room, our Carnarvon accommodation provides every comfort possible to ensure you have an enjoyable stay. From comfortable accommodation to a first-class function space and a family restaurant, our friendly staff go above and beyond to ensure our venue caters for any requirements. We’re more than just an accommodation provider; we also have a fully-equipped function space that’s suitable for everything from conferences to weddings. We regularly host catered functions for businesses running corporate workshops and celebrations for special milestone events like anniversaries and birthdays. 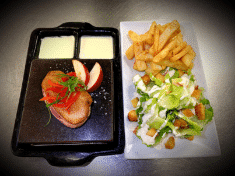 Our hot rock cuisine is the talk of Carnarvon! Delighting visitors and locals alike, we use ancient cooking techniques to produce popular dishes like Atlantic salmon and black angus scotch fillets. Serving breakfast and dinner, plus lunch on request, we even have a great kid’s menu! Serving up a wide selection of tap and bottled beers, our motel in Carnarvon has an impressive on-site bar that even serves an impressive range of ‘top-shelf’ drinks. You will also find a pool table, karaoke jukebox, arcade games, and a kid’s play area that can be easily seen from all areas of the bar. 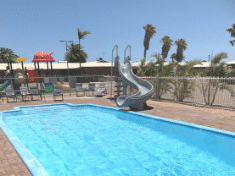 As well as the above-mentioned features, our accommodation in Carnarvon also has an outdoor pool, waterslide, patio, barbecue area and children’s playground. Our motel guests can also enjoy the convenience of 24-hour check-in and have access to snack vending machines. 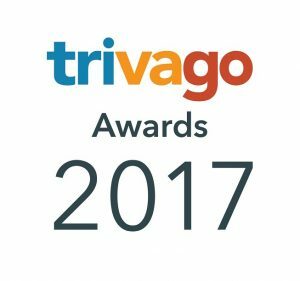 If you would like to see what others have said about their stay, or would like to leave your own review, take a look at our TripAdvisor page.